I'm a little late with this news because I just now noticed that the Stars announced it via Twitter on 4/2/13. For the third straight year, the Stars will hold their 2013 tryout camp at Ridder Arena (pictured on the left), on the campus of the University of Minnesota in Minneapolis. Click here to read the tweet from the Lincoln Stars. I'll embed it below as well. The Stars tryout camp will again be held at Ridder Arena on the campus of U of Minn from June 6th-9th.Add'l info TBA. As mentioned above, the dates of the 2013 tryout camp are June 6th-9th, and the exact times of the scrimmages will be announced at a later date. Click here to read some background information about Ridder Arena, which is where the University of Minnesota women's hockey team plays their home games. 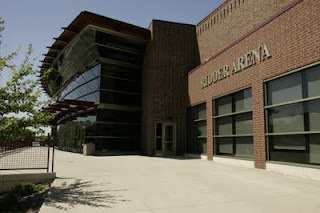 Mariucci Arena, where the men's University of Minnesota team plays, is located right next door to Ridder Arena. Click here to view a Google maps view of the area. Minneapolis is about a 7 hour drive from Lincoln, NE. Just like the past five seasons, I will be at the tryout camp once again and will report back to the blog with numerous articles throughout. Last year (and the year before), I thought the tryout camp was huge hit. I talked with numerous player parents who said they likely would have not brought their son to a camp held in Omaha because it was easier and more convenient to get to Minneapolis. Holding the camp in Minneapolis, as opposed to Omaha, allows to the Stars to bring in more players, which makes the talent pool even larger for the Lincoln coaches to pick from. It's not as accessible for fans, but in the long run I think it definitely benefits the team. The University of Minnesota campus is beautiful, and the facilities within Ridder Arena are top notch. The campus is very close to downtown Minneapolis, but not too busy. The Mall of America isn't too far away, and there are plenty of food options near the rink in between scrimmages. The only negative is lack of on-street parking around Ridder Arena. This is my favorite offseason event of the season, so I can't wait to get up there and watch four days of hockey. It's pretty much heaven for a hockey nerd like myself. Anyone else planning on attending? This is a great opportunity to schedule a mini-vacation, and get your Lincoln Stars hockey fix.